The Approval web part shows timesheets for last week (or earlier) that haven’t been approved. From here, a manager can click to View a timesheet that needs approving. This takes them to the ‘My Dashboard’ page, and displays the timesheet in question on the TimeSheet web part where they can modify or Approve the timesheet. It also warns about users who have No Timesheets for last week only. For this feature to work the user must be in the Administration > Users list and marked as Active. The Status web part shows which users are currently logging time using the Punchcard web part. 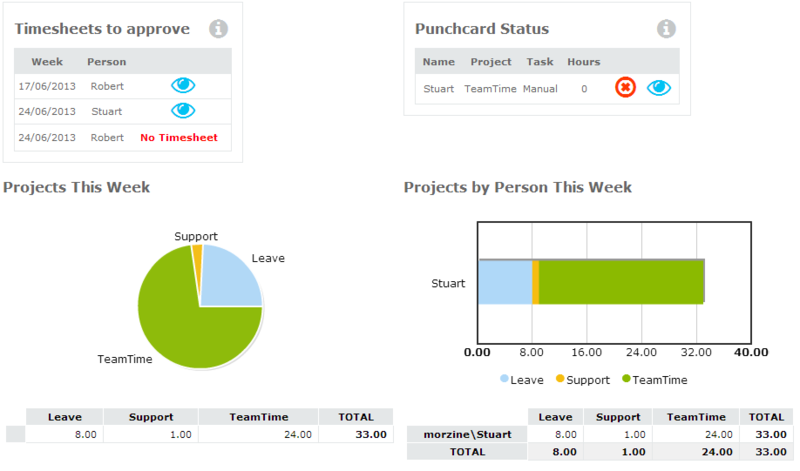 From here a manager can click Stop to stop the user logging time (as if the user had clicked Stop on the Punchcard web part themselves), or click View to see the user’s timesheet for this week.